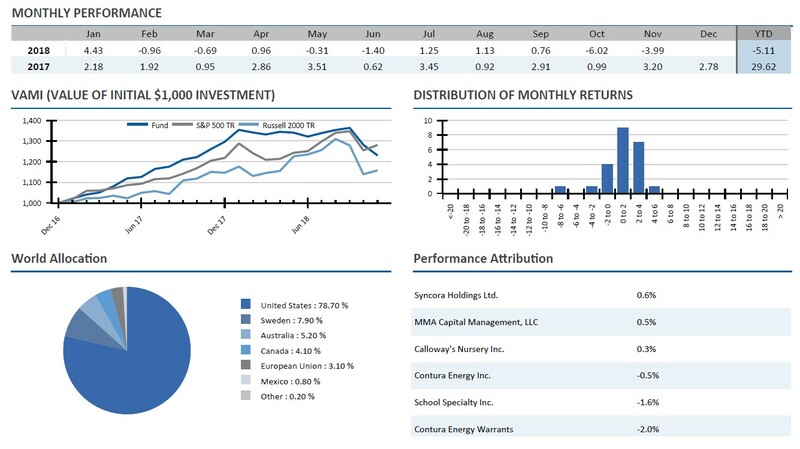 Alluvial Fund, LP was down 4.0% in November. Year-to-date, Alluvial has returned -5.1% versus 5.1% for the S&P 500 and 1.0% for the Russell 2000. Since inception, Alluvial Fund, LP has returned 23.0% compared to 28.1% for the S&P 500 and 15.8% for the Russell 2000. Alluvial Fund, LP is a value investing partnership with a focus on small companies and obscure securities, both domestic and international. The full November tearsheet can be found below. Alluvial Fund, LP is dedicated to identifying and profiting from deeply mis-priced securities in the US and abroad. Alluvial Fund focuses on small firms, thinly-traded issues and special situations, seeking to identify value that the market has yet to notice. The partnership’s goal is to compound its partners’ capital at superior rates over the long term. A poor report from School Specialty and fears of a declining metallurgical coal prices hurt Alluvial Fund’s performance. Broadly positive earnings results from the portfolio’s largest holdings were insufficient to stem the decline.